As your friendly neighbourhood Olympic has-been, I’m often asked to share my favourite exercise routines. My first suggestion is always the same: pursue joy in movement, and joy in effort. The more you look for these two sources of joy, the fitter you will become. Plus, you’re much more likely to stick with a joyful exercise routine, than a boring one. 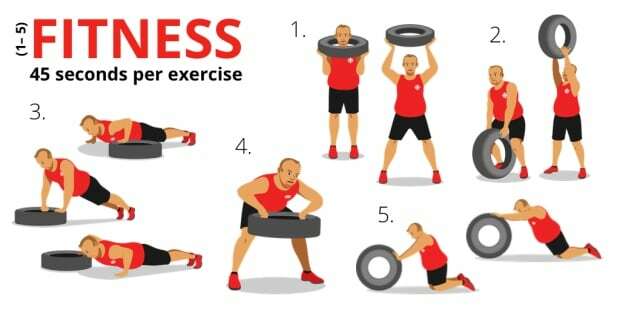 I love this workout because it brings me back to playing with old tires as a kid. Adults would discourage me. “You’ll get dirty. That’s trash,” they would say. And I’m sure that a rolling tire came dangerously close to traffic more than a couple times. Now that I’m an adult, I can pick a clean tire and can control my tire rolls. Tyler Goodale, one of Canada’s best strength and conditioning coaches, was crucial in the design of this exercise program. He helped train my rowing team on our path to Olympic gold and currently works with Olympic athletes and hopefuls at the Canadian Sport Institute Pacific. He’s helped me design these workouts to be accessible to athletes of all abilities. There are three levels to this workout: Health, Fitness and Challenge. Get started with the Health level and work yourself up to Challenge. Start with the warm up. Do the workout. Cool down. You will need an interval timer for this workout. Lay the tire down on its side and side-step in and out of it. Focus on your movement and how your body is feeling; gradually build up the speed of the movement as you feel yourself warming up. Break a light sweat by the end of the warm-up. Leave the tire on the ground for this one. Do jumping jacks for 30 seconds. Pick up the tire and swing it between your legs up to the height of your chest. Lay the tire down again and do inclined push-ups on the tire. The instability of the tire wall strengthens your stabilizer muscles and core. Bend over an upright tire and lift it up to your stomach. Get on your knees and roll the tire away from you as far as you can without falling on your face. Then roll it back again. Stick your head through the tire with your hands grasping the edge. Lift the tire when you jump your legs apart. Grab the upright tire with both hands. Swing it through your legs and then lift it over your head by driving from your hips. Rotate the tire while swinging to get a better grip. Throw the tire away from you, and down on the ground if you lose grip or balance. Start in pushup position with one hand on the ground and one hand on the edge of the tire. 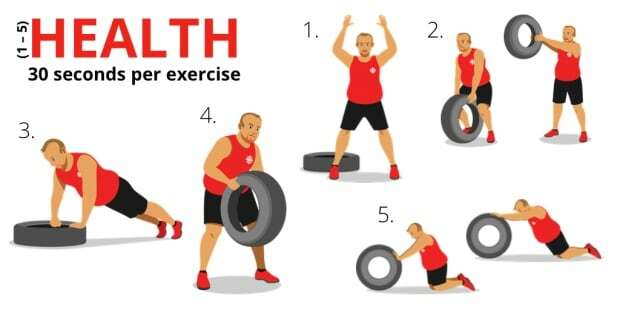 Do a push-up, then walk both hands onto the tire. 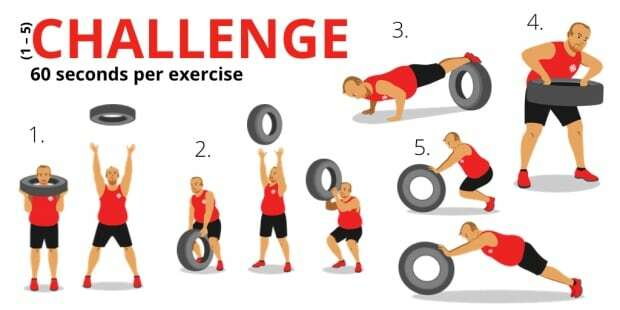 Do another push-up, then walk your outside hand onto the other side of the tire. Keep alternating between push-ups and hand-walking on and off the tire. Tire should be resting flat on the ground. Bend over tire, grab inside rim and lift it up to your stomach. Stick your head through the tire with your hands grasping the edge. 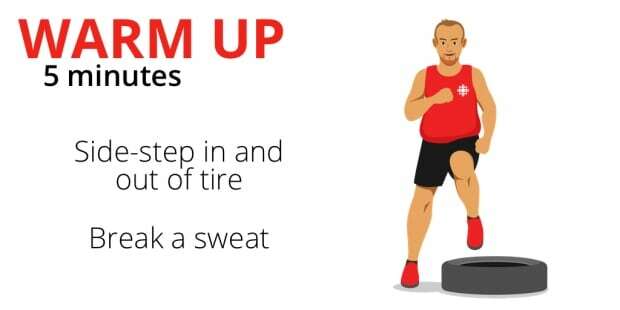 Lift the tire over your head, and then toss it into the air, when you jump your legs apart. Catch the tire, or bat it away if your release makes catching awkward. Grab the tire with both hands. Swing it through your legs and then lift it over your head, and let go, by driving your hips. Rotate the tire while swinging if you need to get a better grip. Catch the tire and repeat. If you become tired, let the tire bounce onto the ground and catching after one bounce. Balance your legs on the upright tire while doing push-ups. Move the tire back and forth with your feet as you go. Rest tire flat on the ground. Place rocks, chains, Olympic gold medals or other heavy objects inside the tire. Bend over tire, grab inside rims and lift it up to your stomach. Squat and roll the tire away from you until you’re on your toes. Then roll it back again. Stretch by alternating between the “Butterfly” and the “Hamstring Hero.” Practice some deep breathing for five minutes to help calm your body and mind. Send Adam Kreek a message on Twitter @adamkreek. You can also find more tips to improve your body, mind and soul on the Don’t Change Much website or through Adam’s column on CBC Sports. Adam delivers authentic keynotes, workshops and seminars for corporate, government and not-for-profit organizations worldwide. Please contact us for information about our offerings.